For the last 2 years or so I’ve become accustomed to a light breakfast of Fruits or Smoothies, but every Sunday I like to treat myself to a nice hearty Brunch (because I have the whole day free to recover from my food coma!) – and I’ve had this recipe in mind for a few weeks…It comes straight from Dreena Burton’s Eat, Drink & Be Vegan: Everyday Vegan Recipes Worth Celebrating, which has some fabulous recipes! 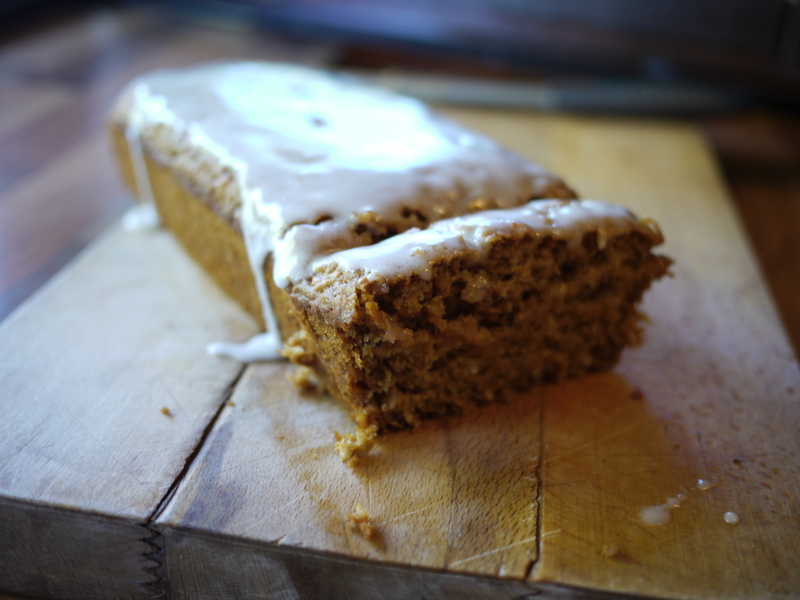 I used Whole Grain Spelt flour for these, which produces quite a ‘wholesome’ texture, so I would suggest that you maybe try it with Light Spelt if you have it on hand – I’m sure Wheat flour would make a fine substitute too, if it’s not a problem for you. 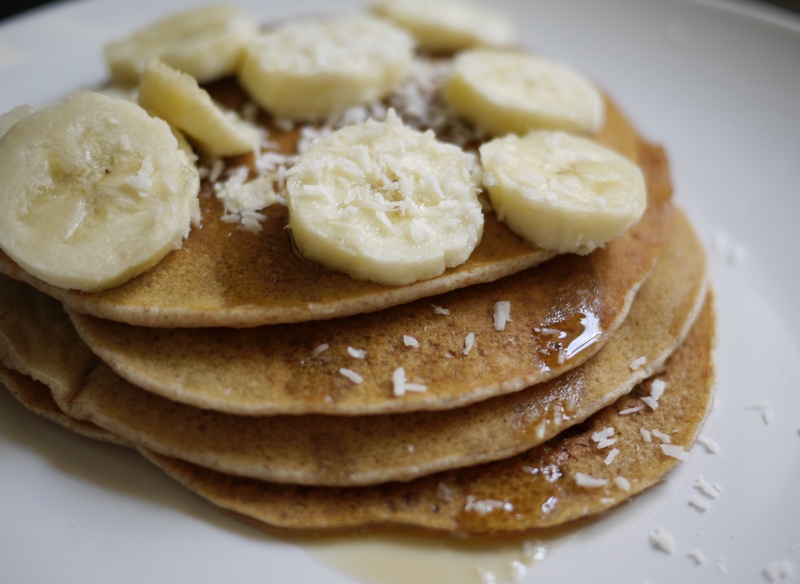 Even though they contain Coconut Milk, the pancakes don’t have an obvious Coconut flavour, so adding dessicated Coconut or an extract would be good if that is what you’re looking for…The overripe Banana adds enough sweetness, so that there is no need for extra Sugar. These are not South African style pancakes (which are more like Crepes) – they come out thick & small, perfect to stack on top of eachother and cover with Maple Syrup & Bananas! – In a large bowl, add Flour and sift in Baking Powder. Add Cinnamon & Salt, and stir to combine. In a blender combine Coconut Milk, Banana, and Vanilla Extract and blend until smooth. – Transfer wet mixture to dry, and stir just until well combined (don’t over mix), adding more liquid if needed to reach desired thickness (if mixture is too thick, pancakes will be very doughy). Set aside. – Spray a frying pan with Oil (spreading it with a paper towel), and heat on medium-high heat until very hot. Reduce heat to medium-low, and using a ladle or Ice-cream scoop, pour batter into pan to form pancakes. Let cook on one side for a few minutes, until bubbles start to form, then flip and lightly brown other side for 1-2 mins. Repeat for the rest of the batter, re-spraying pan if needed. *Set your oven to 120C/250F and keep Pancakes warm on a foil-covered plate or tray until ready to serve. – Preheat Oven to 350 F/175 C, and grease square brownie tin. – Mix Spelt and Oats in a medium sized bowl until combined. Add Coconut, Nuts and 1/2 cup of Raisins and mix well to make sure Raisins are coated with Flour and not sticking together. – Spread Brownie dough into the pan, and smooth the top with a spatula. – Bake around 20mins. depending on oven. 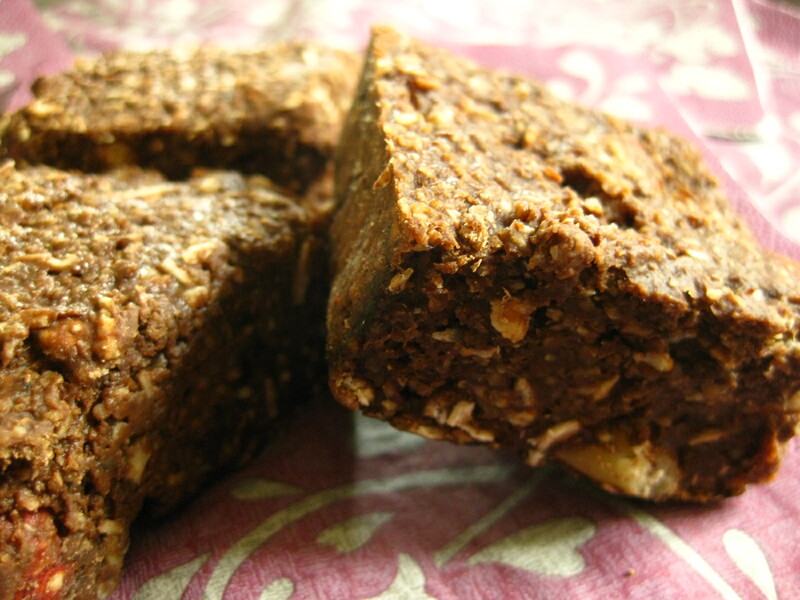 Brownies should be firm, but not hard – do not overbake. – Remove from oven, let cool before slicing.